This stitch continues the wrapped backstitch base…but uses a slightly wider base than the last two stitches used. I encourage you to play around with different half circle or half oval shapes to find the best fit for your project. Create a wrapped back stitch ‘spoke’ at the vertical position, horizontal right, horizontal left, and 45 degree left/right. Tuck a detached chain stitch between these lines using a different color of thread to ensure a clear definition of your stitches. I’m getting a little more uniform with the wrapped stitch…so this one was fun. Of course, I had to use my favorite little “palm” of straight stitches! This time I added a horizontal little base at the bottom of each arch as well…and a little French knot to finish it off. This stitch is made using a tissue paper technique we did for stitch #69 with two exceptions. First, reduce the width of the stitch ‘loop’ so the stitch is more of a series of half circles. 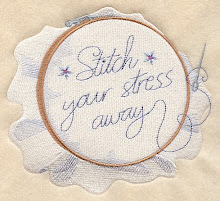 Second, after you stitch a series of back stitches…remove the tissue…and wrap each stitch by sliding the needle (eye first) under each back stitch. Don’t pierce the fabric. This will effectively wrap the line of back stitches and create more texture. 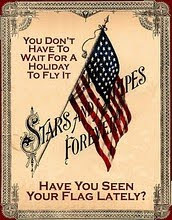 The long vertical post and other posts that form the “star” are also back stitched and then wrapped. 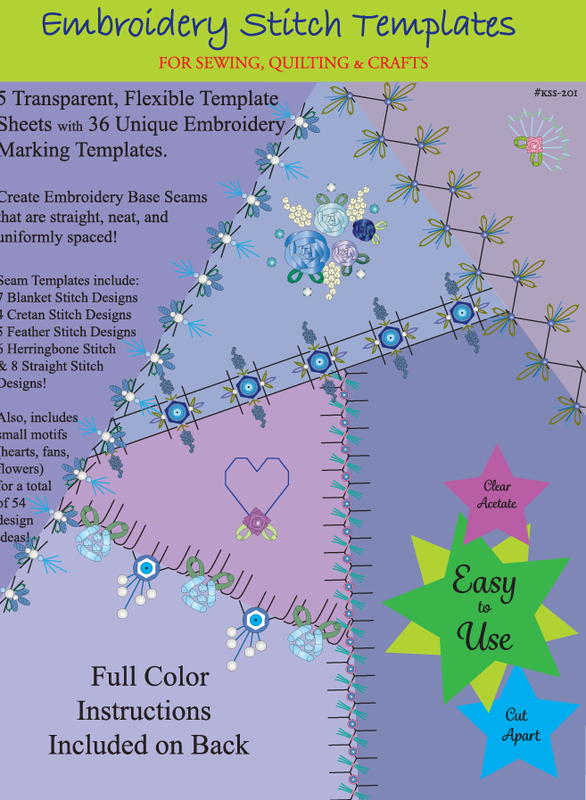 They can be drawn on the tissue and the entire design can be back stitched at once; or you can just estimate these lines after the base is completed. Once you get uniform back stitches…and the feel for wrapping them…I think you’ll really like working this technique. I hope so, because we will be using it for the next dozen or so stitch treatments! Hopefully, you'll be able to get your 'loops' more uniform than I did these! Buttons, sequins, beads, and SRE or embroidery flowers would be cute inside of the loops too. 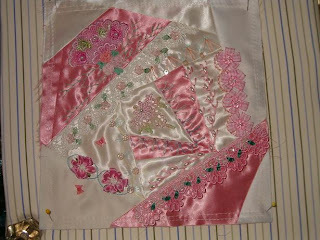 This stitch is made using a tissue paper technique. Draw the “loop” the depth and width you desire. Pin the paper to the seam line…and back stitch (as uniform as possible) to fill the line. Back stitches were also used to create the vertical long stitch. 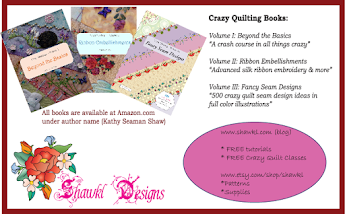 The detached chain or lazy daisy stitches are slightly apart from the straight stitch. The space between all of these would be a great place for a pearl or crystal bead to rest. I'm managed to do a little more CQ lately...in between all the other pulls on my time lately. These are two blocks to contribute to a replacement quilt for a family that lost a CQ family heirloom in a fire. The gals at MAP/SAM are working them up...and these will be mailed out tomorrow. It is still amazing to me that so many stitches can be made of such simple elements! This stitch is the last of the chain arch stitch varieties. It is a balanced stitch that would not need any other adornments to be complete. Next we will continue to work with half-circle bases…but will use a simple wrapped straight stitch as our method to construct the base instead of the chain stitch. However, any base can still be done with the chain if you desire. The extended arches on this stitch would go a long way to fill in space. The cluster of straight stitches in the middle of the long vertical stitch reminds me of stars. The addition of a star charm, bead, or perhaps a snowflake sequin under each archway would transform this simple stitch into a real gem! This stitch is very appealing to me. I like that the little straight stitch ends the arch and the French knots add decoration. The lazy daisy helps to fill out the stitch. An alternative for this stitch would be to add a vertical straight stitch before adding the little straight stitch to add length if you wanted to deepen the stitch more. 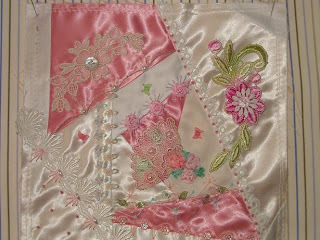 Extending the “leg” of the arch with this straight stitch increases the depth of the stitch; and provides extra room under the arches for additional ribbon or bead work. An alternate to this could be to add more lazy daisy stitches around the French knot to have a full flower at the end of each arch. Wow...that's a topic we could talk about all day! But, just wanted to share one of my very favorite organization tools.....dresser drawers or bureaus...or whatever name you have for them. I use several throughout my kitchen and sewing room. Since I live in a very tiny apartment...my sewing stuff is almost in every room! Here's an old dresser that I just got from my sister, Rita...who does painted wood. I really liked the shallow drawers. 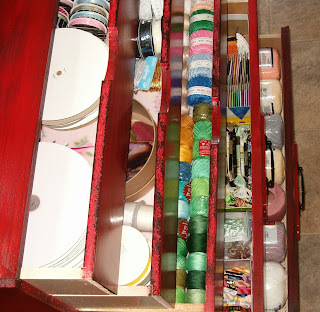 At first, I thought it would be great for my laces...but then thought that perhaps I could finally get all the sizes of embroidery fibers and ribbons/trim organized. Well, it isn't all in there...but the majority is!! ROFL...maybe I could get her to find a couple of more for me! So, when you are thinking of organizing your sewing room...look for discount dressers! They are great for holding projects if the drawers are deep. They are super for holding supplies if the drawers are shallow. And, you can stack little clear containers on top for even more use! Anyone else use dresser drawers to store their supplies? Oh, and my baby..."Buddy" had to get in the photo as well. "What ya doing Mom?...is that food?"